I have a soft spot in my heart for lemon desserts. It all began many years back after one memorable and luscious lemon tart from Le Pain Quotidien. After that moment my love of lemon never ceased. The way a lemons tartness marries so perfectly with sweetness in desserts in something magical. Lemon tarts, lemon meringue pie, lemon cake, lemon shortbread cookies, lemon bars, lemon ice cream, the list of lovely lemon desserts is endless. Make those lemons Meyer lemons and things get event better. 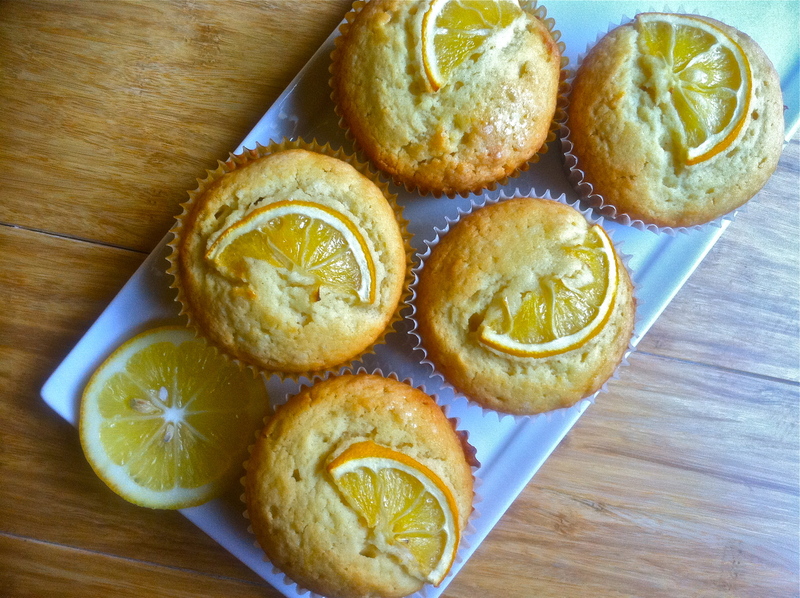 That brings me to this week’s Muffin Monday – Meyer Lemon Pound Cake Muffins. These muffins are aromatic gems of deliciousness. They have a nice density and heft (a la pound cake) and a pleasant acidity from the Meyer lemons. I added creme fraiche to the mix which rounded out the sweet and tart flavors of the muffin. If you like your muffins to be a little lighter and soft you can soak these muffins in a lemon glaze after they cool. I however love a rich dense pound cake so these were perfect for me so the only topping I added was some sugar before they went into the oven which gave them a bit of a crunch and caramelized the Meyer lemons slices that crown the muffin. Give me some lemon and I’ll give you my heart! Add lemon zest, lemon juice and vanilla extract, beat to incorporate. soda; add to creamed mixture just until moistened. Combine the glaze ingredients; drizzle over muffins. Serve warm. i am with you on the lemon desserts all the way! i love the lemon slice baked op top..bold move! Oh my goodness!!! Your muffins look absolutely amazing! I bet they are just bright, fresh and delicious. I love the lemon slice on top! Love the presentation. Can’t wait to join you all again. barbie – thank you same to your muffins! anna – there is nothing like lemon! These look lovely. I especially like the lemon slice used as a garnish! I was lucky enough to have a bite of these and they are AWESOME! These look so good! I love Meyer lemons too so this recipe is a must make for me. allie: Meyer lemons are the best I can’t wait to bake something else with Meyer lemons! Can sour cream be substituted for the crème fraiche? Live in the middle of no where, and grocer has very limited choices.